The Nimpkish River is a major waterway on Northern Vancouver Island. 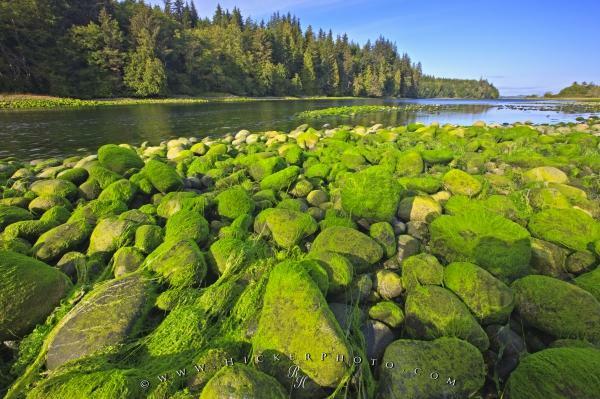 Rocks along the river banks are cloaked in green algae, adding a splash of colour to the landscape. Green algea on rocks at low tide in Nimpkish River on northern Vancouver Island, British Columbia, Canada. Photo of the Nimpkish River, a waterway on Northern Vancouver Island, BC, Canada. Pictures from photo gallery "River Pictures"
This picture is part of the photo album "River Pictures" - there are more beautiful images waiting for you.